Elgin Public Library, in partnership with the Nebraska Library Commission, offers a wealth of online information through NebraskAccess at nebraskaccess.nebraska.gov. As of July 1st, Nebraska residents have access to a refreshed lineup of 15 databases, including 13 new resources that have been added to expand access to a wide variety of information.With today’s Internet cluttered with information, how do you select reliable sources? “Try NebraskAccess: your information connection across Nebraska,” recommends Joyce Sullivan. Community residents looking for free resources to create a family history, establish a small business, learn about medical conditions, get homework help, find a good book or movie, plan for retirement, or research thousands of other topics will find dependable current information in NebraskAccess. NebraskAccess provides Nebraska residents with free 24/7 access to premium databases containing thousands of full text popular magazine and journal articles; primary source documents; genealogical, health, legal, small business, and science resources; reading recommendations; and research resources for K-12 students. These resources are available to Nebraska residents at no cost. The Nebraska Library Commission purchases subscriptions for Nebraskans with funding from the State of Nebraska and the U.S. Institute of Museum and Library Services. Residents can link to NebraskAccess resources from computers at home and at Elgin Public Library or at public, K12 school, college, or university libraries across Nebraska. Access these resources from any Internet connection using one password (given at the library), or a Nebraska driver’s license, or state identification number. Today, nearly 1,020 public, school, college, university and non-profit libraries partner with the Nebraska Library Commission to offer NebraskAccess resources to their customers and students. Many of these libraries could not afford to provide this on their own. 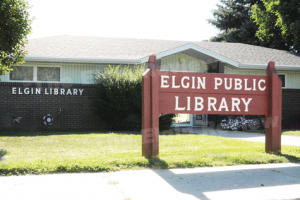 For more information, contact the Elgin Public Library at 402-843-2460. Library hours are Monday 5-7 p.m., Tuesday 1-5 p.m., Wednesday 1-7 p.m., and Thursday and Friday 1-5 p.m.